Customs duties and taxes are collected based on the transaction value which is derived from the value stated on the invoice (once authenticated), receipt or other proof of purchase. 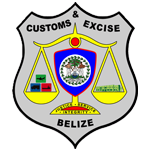 The dollar value must be converted from the foreign currency stated on the proof of purchase document to Belize (bzcy) currency. The Belize currency is tied to the US dollar at $2.0175 bzcy to $1.00USD. Other foreign currency rates are subject to change and is updated weekly in conjunction with the Central Bank of Belize. The importation of some live animals, foodstuff, plant and plant materials, veterinary vaccines requires an import permit (view list) from the Ministry of Agriculture and is subjected to inspection at the time of importation by Quarantine Inspectors. General Sales Tax is charged at a rate of 12.5% based on the aggregate of the customs value and any other relative duty (Import Duty, Environmental Tax and RRD if applicable). Some commodities are exempted from the payment of General Sales Tax at the time of importation. Imports from Caricom Countries are exempted from the payment of import duty provided the importer produces a Certificate of Origin from the country within the Common Market certifying that the goods were produced within the region of the common market. Some commodities imported from Caricom pay Revenue Replacement Duty (RRD). There are restriction for certain commodities imported from Caricom and requires an Import License from Ministry of Trade prior to importation.